I applied UR5 to my 2016 landscape the other day. I used Kevin Holman’s excellent UR5 update blog post, verified all of the proper versions, everything looks great. I then checked the “SCOM Management” node (from Kevin Holmans SCOM Management management pack) and it reports my SCOM version as 7.2.12016. When I run the command “Get-SCOMManagementServer”, I get version 7.2.11719.0. Has anyone else noticed this after they upgraded to 2016 UR5? 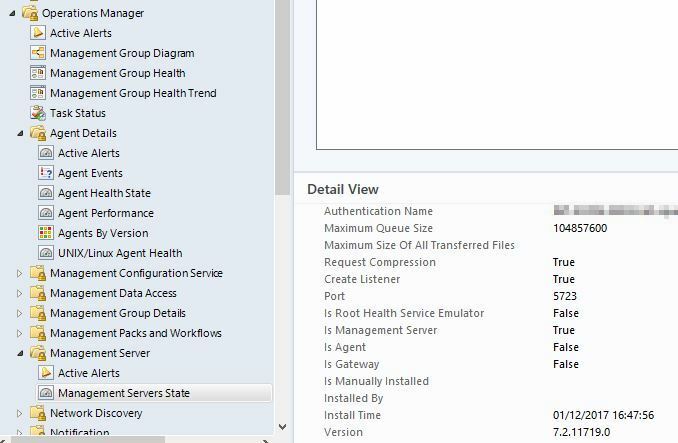 Wasn’t part of the premise of the SCOM Management MP, that it shows actual agent/server versions?